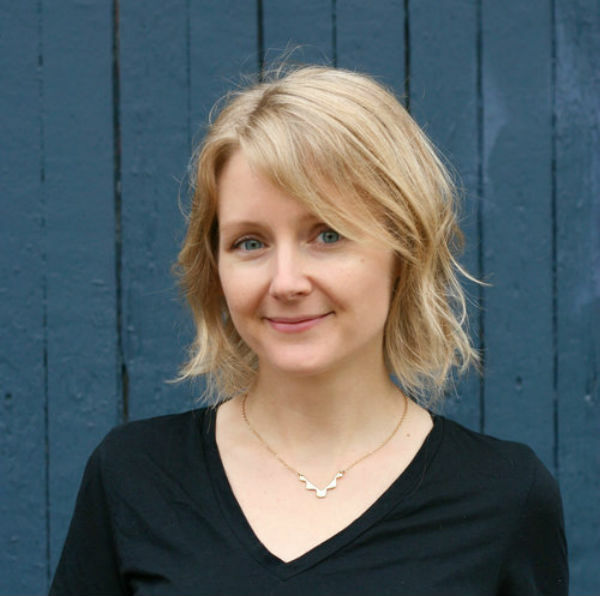 Chelsey Johnson’s brilliant debut novel Stray City (Custom House, March 2018) follows Andrea Morales, a young queer woman who escapes Nebraska in the late 90s to attend college in Portland, Oregon, where she immerses herself in the lesbian community and punk culture. A card-carrying member of the Lesbian Mafia, Andrea creates a new life and home in Portland, where she finally feels like she belongs: “We knew each other. I’ve never known anything like it and won’t again. To recognize someone anywhere you go.” But things take an unexpected turn after she hooks up with a cis-man and gets pregnant. 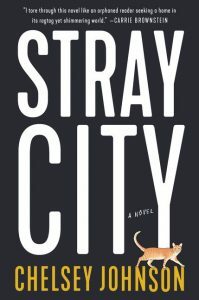 Stray City is a hilarious, smart, and complicated novel about queer identity and community and self-discovery, and about the homes we leave and the homes we create. Johnson writes beautifully about a particular time and place—a queer space of refuge and possibility—with nuance, insight, and wit, and creates unforgettable, compelling characters. I spoke with Chelsey just before Stray City’s publication. I love books with a strong sense of place, especially queer novels. Stray City is set in Portland, Oregon, with much of the novel taking place in 1999-2000, and in the acknowledgments you write, “this book is a homesick love letter.” Why did you want to write about this particular, almost mythical time–“the old Portland,”–and its queer community? I moved to Oberlin, Ohio in 2008 for what I thought was a temporary teaching gig that ended up not being temporary. And on an early trip back to Portland, I remember driving from Southeast to North Portland on side streets, I didn’t want to take the highway, I just wanted to savor the town again. And as I drove, every intersection and neighborhood triggered a story—that’s where so-and-so used to live, there’s where I remember that party at that house, this was my bike route, there’s the cafe where Peyton and I used to write together, etc. I have never known a city so intimately–that cliché “like the back of my hand” felt ridiculously apt, the streets might as well have been veins. And now that I lived so far away, and wasn’t sure when I’d make it back, I felt almost frantic with wanting to archive that knowledge and that feeling. And I wanted to set it back little at the end of the 90s because I wanted to make it really analog. No cell phones or social media. A time that required your actual, real-life presence. Because now all my friends were digital avatars. Yeah, you can feel the love for Portland, but it’s also not nostalgic or sentimental. So about those identity politics… Andrea, the protagonist, is a queer woman, and the majority of the characters in the novel are lesbians and trans folks, a population we don’t see enough of in literature. What kind of resistance or support did you find in the writing and publishing world for writing these characters? 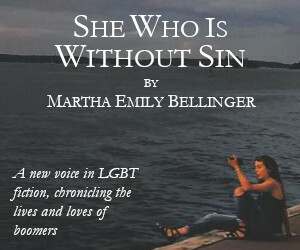 I was very lucky to get an agent who is not only super savvy and talented but also gay (and gay in a punk way), who really got the sensibility of the book and knew how to pitch it and who to send it to. And I was very very lucky that the editor who ended up taking the book was raised by gay dads and she immediately connected to the manuscript. The only resistance I really faced, besides a couple of baffling responses from editors, was the little army of queer critics in my own head. They were really hard on me while I was writing. Right, that makes sense—you delve into the rigidity and exclusionary attitudes of identity politics, but it’s set in a very particular time. That’s very clear. Right! I would hate for anyone to think that these are my views now. It’s an archive of a particular mindset. Or to clarify, especially with the intense biphobia these characters internalize and express, that is a hallmark of that time and certainly not my own personal views! This novel is about a particular time and place, but it’s also very much about the passage of time and aging. Why did you decide to skip from 2000 to ten years later? I skipped ahead ten years because I wanted to get to that point where Lucia [Andrea’s daughter] is old enough to start thinking about who she is and what the real story is with her biological dad. Nine, ten, is when that usually happens for kids, and it’s an interesting age, because they’re still little kids, so open and funny and weird, and yet they’re also becoming smart and thoughtful and independent. Also, I started writing the novel in 2009, and I wanted to get to (what was then) the present! You write about motherhood and raising a child that feels new, resisting many of the typical motherhood narratives and tropes. In thinking about the colors associated with motherhood, Andrea observes, “The industry that marketed motherhood in pastels and cursive was a joke. In reality it was dark red and animal and iron.” What drew you to writing about a young queer woman who gets pregnant and decides to give birth? It was kind of a back road that turned into the main road! Originally the novel sprang from a story about Ryan, stranded in Bemidji with the van and the cat. And I decided he’d left behind this girlfriend in Portland. But then I was so bored: oh great, straight people problems. I thought, surely I can make this more interesting. Then I thought, what if Andrea is a lesbian? And the story immediately got interesting to me! Then, obviously, that story completely swallowed the Ryan story, which I mercilessly slashed down to a little epistolary interlude. And for Andrea to have the baby made for a more interesting story than for her not to. It forced things into the open. So it was a richer narrative choice. I also like pushing back against typical tropes of what it means to be a parent, or specifically a mother, and how families form and get made. That’s so interesting that you started with Ryan. I spent two years writing Ryan. Then cut 90 percent of it at the very end. I might harvest it for parts later. If anyone wants to read about a bereft dude skulking around a small town and hanging out with some punk teenagers and just thinking a lot. It really needed to go. That’s how it often goes though, right? It always takes me such a long time to figure out what my story is actually about. How long did it take you to write Stray City? Anything else you can tell us about how the writing process went? It took me seven years! Which, if you’d told me that when I was younger, I would have been stunned and horrified. But during that time I was living and teaching and moving and occasionally abandoning the novel for weeks at a time, certain it was doomed. Parts one and two took me five years. Part three, I wrote the first draft in ten weeks. By then I knew who everyone was, finally, and it poured out. It was such a relief. I had also finally learned how to write quickly and badly, and revise later, instead of retooling every chapter like a precious ship in a bottle only to discover later that it was the wrong ship and I had to break it anyway. One day I want to be one of those people who writes a novel—a beautiful, stunning novel—in 2 or 3 years. Oh my god, no kidding. My goal for my next book is 200 pages. One time period. One main character. I love the structure of the novel. Can you also talk about your decision to shift the point of view in parts 2 and 3? I’m also curious in your decision to include lists, letters, emails, and postcards as part of the narrative. I knew from the start that the book would be three sections—one Andrea, one Ryan, one Lucia. I thought they’d all be third person. But after a while I switched to first for Andrea just to see what would happen, and instantly this voice emerged and it started to move. It’s kind of all-consuming in the way that the dilemma is for her. Ryan’s section was always littered with postcards and calls, but when I cut it down, I decided to make it totally epistolary. It comes halfway through the book, and that’s when I often put down a good book and never return, so I wanted to make that part terse and quick-moving, like Ryan himself, pithy little pages that are easy to flip through, to keep the momentum going, and of course since it’s epistolary it’s all second-person. In the third section, I wanted to filter the experience not just through Lucia but also through Andrea and Ryan and even Beatriz, so the cumulative weight of the story is passed around among the characters, shared, since they’ll each experience it so differently—and that also keeps things moving along. The lists and other forms are a really efficient way to convey information beyond standard expository narrative, and also to entertain myself as much as anyone—I wanted to hold my own interest, and figured that would hold the reader’s too. I’m still thinking about how this didn’t start out as a queer novel. I really love how directly you write about queer culture and identity; you use queer slang and terms without explaining to hetero or cis readers, such as binding, or gold-star status. Andrea doesn’t code-switch for the reader, and the tone, when discussing queerness, is unapologetic, which I really appreciated. Who was your intended audience–did you think about audience while writing? I totally thought about audience. I definitely wrote it with a queer readership at the forefront of my mind—and no small amount of anxiety about doing justice to the material and the community. But I also wanted very much to reach a wider readership, too, without pandering or translating–I hoped that if I rendered the characters and story and world honestly and vividly enough, it wouldn’t matter if every reader didn’t catch every little detail. So I put in plenty of little easter eggs for the queer readers and the Portlanders. I think that if I had set out to write a queer novel, I would have immediately been flummoxed and overwhelmed by how to begin. It would have felt like a monumental duty to get it right. The army of queer critics in my head would have been so bossy and contradictory I would never have gotten it done! And subconsciously I think I’d internalized that having it be equally a straight man’s story would legitimize it as a novel, as a project. That was the literary model I’d soaked up all my life. Well I’m very happy you put a queer novel into the world! Thank you! I am too! I really did grow fond of Ryan as I wrote him, but it felt so good to shed his weight in the novel and immerse myself in the queer world. The novel takes place during an era, which I remember well, when people were still making mixtapes and CDS, and music is very much a part of the setting–Ryan is in a band, many of Andrea’s friends play music, and for awhile she takes up the drums. The characters are often going to shows or performing. Did you listen to anything specific while you were writing it? Or, if not, how did music inform this story? Oh, I killed a lot of time making myself soundtracks to each section! Music and people who make music and going to shows have been so central to my life, all my adult life. Punk and riot grrrl influenced me hugely, not just musically but politically and aesthetically as well, and my friends too. I didn’t set out to write a book that was heavily into music, but because it saturates my life, and especially my Portland life, it’s all over in the book. While I was writing, I made soundtracks for each character, of course, but I actually listen to instrumental stuff when I write. Yo La Tengo’s They Shoot, We Score more than anything, but also William Tyler and of course the queer Portland guitar wizard Marisa Anderson were in heavy rotation. Do you play any instruments or were you in bands? I’m pathetically ungifted at most band-worthy instruments. I played bass (terribly) and then keyboards (okay) in a couple of bands in college, and in grad school I got a cheap Danelectro guitar and some poets and I had a farmhouse basement band. In Portland, hilariously, my flute playing got me called in for some session gigs, and I played a little bit with Cynthia Nelson’s band. But really, my band skill set is designing T-shirts and selling merch. And earnest karaoke. Flute playing, that’s very Portland…. So what is your next project? I’m working on a nonfiction thing, shape still to be determined, about a gay liberation endeavor in the early 1970s, and a second novel that involves public lands and wolves. Any advice you have for other writers? One thing I tell my students that I also need to remind myself regularly: Estimate how long you think it will take to write something. Then multiply that by three. That’s how long it will take you to write it. Plan accordingly! And also, don’t quit something too soon. Just keep going to the next corner, and see what’s around it. Carter Sickels is the author of the novel 'The Evening Hour' (Bloomsbury), a Finalist for the 2013 Oregon Book Award and the Lambda Literary Debut Fiction Award. 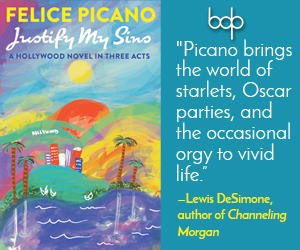 He is the recipient of the 2013 Lambda Literary Emerging Writer Award. His essays and fiction have appeared in various literary journals and anthologies, including Guernica and Buzzfeed, and he is the editor of the anthology 'Untangling the Knot: Queer Voices on Marriage, Relationships, and Identity'. He's been awarded fellowships and scholarships to Bread Loaf Writers' Conference, the Sewanee Writers' Conference, and the MacDowell Colony.